He is in good played with condition with paint and or play wear. In amazing condition super rare series 5 wrestling figure. Mint Card, case fresh, crystal clear bubble, WOW!!! 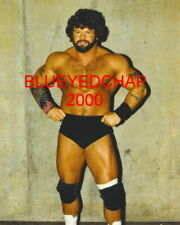 BILLY JACK HAYNES autographed 8x10 photo. Item was hand signed. Of paid invoice, if not sooner. They're intended for adult collectors & for display only! T his is 5 DVD set of BILLY JACK HAYNES. Billy Jack vs Jim Kent (Billy Jack argues w/Terry Funk). Billy Jack/Mie Graham/Mike Rotunda vs Black Bart/Hector Guerrero/One Man Gang (Hi-Lites). BEST OF BILLY JACK VOL. 1987 Billy Jack Haynes LJN Titan Sports Wrestling Figure WWF Wrestling Figure. This figure is in very good condition but does show signs of wear, with some scuffs and paint marks, along with a tiny hole in the side of his boot. You are buying as is with no returns. Please inspect photos before buying. I have over 10 of these photos, so the one in picture will not match the one billy is holding for the photo I took..
On a condition scale of mint, near mint, excellent, very good, fair and poor, I would rank this figure as good. I try to represent each item honestly. Figure Has some paint loss and is in used condition. Figure is sold as is, you will Receive the exact figure that is shown in the photos. I always combine shipping when possible. I do not skimp on the packaging supplies and it is my goal to make sure that your item arrives in the exact condition shown. If you have a problem with an item, please let me know so that we can figure it out. Please buy with confidence, I am a trusted seller. I do not make my living selling on EBay, I do it because I enjoy buying, researching and learning about vintage toys. Feel free to contact me if you have any questions. THIS 100% AUTHENTIC CARD IS A VERY UNIQUE AND INCREDIBLE COLLECTIBLE! All numbered Letters of Authenticity are fully transferable without resubmission. NO RESERVE! One of a kind production process negative that was used to make the actual card. Buy more and save on shipping. I can ship up to 3 cards together at this shipping price BILLY JACK HAYNES LJN WRESTLING SUPERSTARS BIO CARD. Condition is Used. Shipped with USPS Priority Mail. Billy Jack Haynes WWF Trading Card. Circle K Coca Cola Trading Card 1987.